Definition at line 262 of file CGCall.h. Definition at line 317 of file CGCall.h. Definition at line 265 of file CGCall.h. Definition at line 287 of file CGCall.h. Referenced by AddDirectArgument(), commonEmitCXXMemberOrOperatorCall(), decomposeTypeForEH(), clang::CodeGen::CodeGenFunction::EmitAtomicLoad(), clang::CodeGen::CodeGenFunction::EmitAtomicStore(), clang::CodeGen::CodeGenFunction::emitBuiltinOSLogFormat(), clang::CodeGen::CodeGenFunction::EmitCall(), clang::CodeGen::CodeGenFunction::EmitCallAndReturnForThunk(), clang::CodeGen::CodeGenFunction::EmitCallArg(), emitCPPObjectAtomicGetterCall(), emitCPPObjectAtomicSetterCall(), clang::CodeGen::CodeGenFunction::EmitCXXConstructorCall(), clang::CodeGen::CodeGenFunction::EmitCXXMemberPointerCallExpr(), clang::CodeGen::CodeGenFunction::EmitCXXNewExpr(), clang::CodeGen::CodeGenFunction::EmitDelegateCallArg(), clang::CodeGen::CodeGenFunction::EmitDelegateCXXConstructorCall(), clang::CodeGen::CodeGenFunction::EmitLambdaBlockInvokeBody(), clang::CodeGen::CodeGenFunction::EmitLambdaDelegatingInvokeBody(), clang::CodeGen::CodeGenFunction::EmitObjCBoxedExpr(), emitStructSetterCall(), clang::CodeGen::CodeGenFunction::EmitSynthesizedCXXCopyCtorCall(), emitWritebackArg(), clang::CodeGen::CodeGenFunction::generateObjCGetterBody(), clang::CodeGen::CodeGenFunction::generateObjCSetterBody(), getUsualDeleteParams(), hasDefaultCXXMethodCC(), and isWeakLinkedClass(). Definition at line 323 of file CGCall.h. After doing this, the old CallArgList retains its list of arguments, but must not be used to emit a call. Definition at line 296 of file CGCall.h. Referenced by commonEmitCXXMemberOrOperatorCall(), and isWeakLinkedClass(). Definition at line 289 of file CGCall.h. Definition at line 308 of file CGCall.h. Definition at line 3332 of file CGCall.cpp. 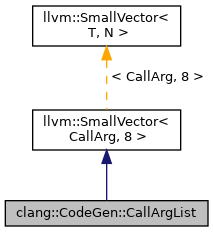 References clang::CodeGen::CodeGenFunction::Builder, clang::CodeGen::CodeGenFunction::CGM, and clang::CodeGen::CodeGenModule::getIntrinsic(). Definition at line 3340 of file CGCall.cpp. Definition at line 331 of file CGCall.h. Definition at line 336 of file CGCall.h. Definition at line 314 of file CGCall.h. Returns if we're using an inalloca struct to pass arguments in memory. Definition at line 341 of file CGCall.h. Definition at line 319 of file CGCall.h.